How to open the gate to The Ancient Ruins - with Pictures. Reworked Ranch Map for Building Set-up. Before you can open the gate you need to find the bloody thing! 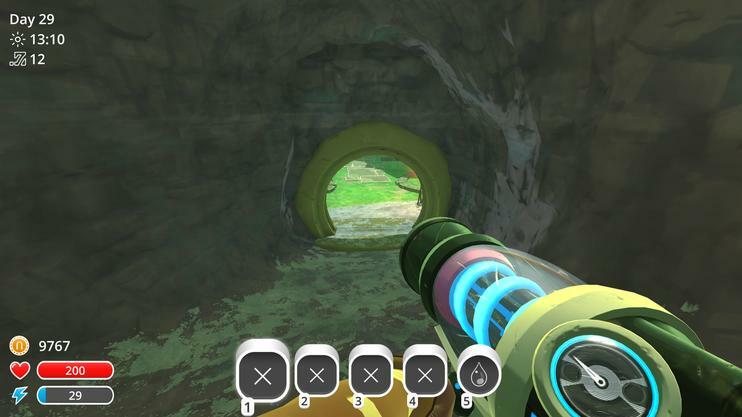 If you head as far into the Indigo Quarry as you can, you will find a cave system that leads to a door, you will need to unlock it with a Slime Key. Entrance to the cave can be found in the top right of the picture. Opened with a slime key. 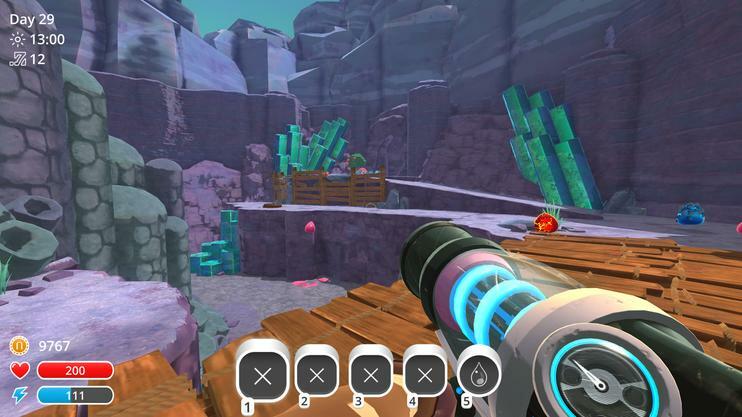 Now you need to collect plorts! You will need ONE of the each of the following plorts. 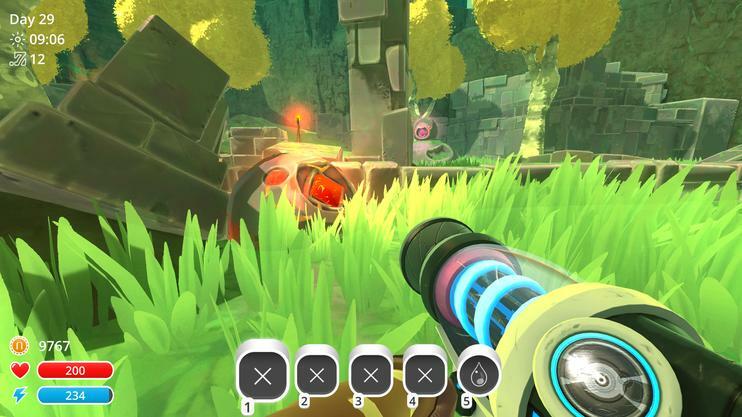 The pink plort is already there for you! Don't come back until you have 'em! I suggest collecting Tabby, Rad and Honey first (as you have limited carry slots) as they won't be found as local to the area. 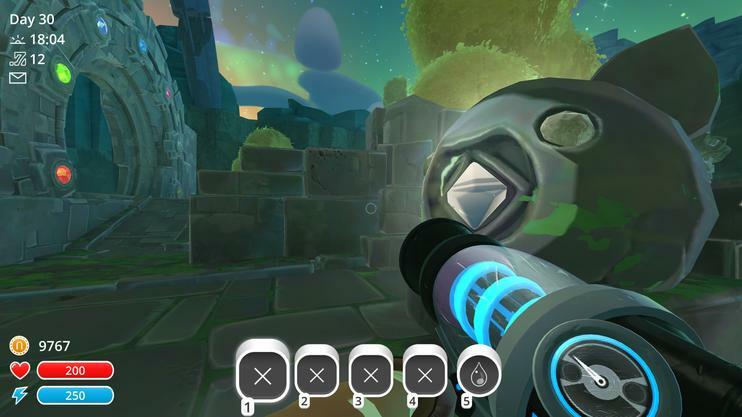 Rock and Boom can be found locally in The Indigo Quarry and therefore will be closer and faster to obtain. 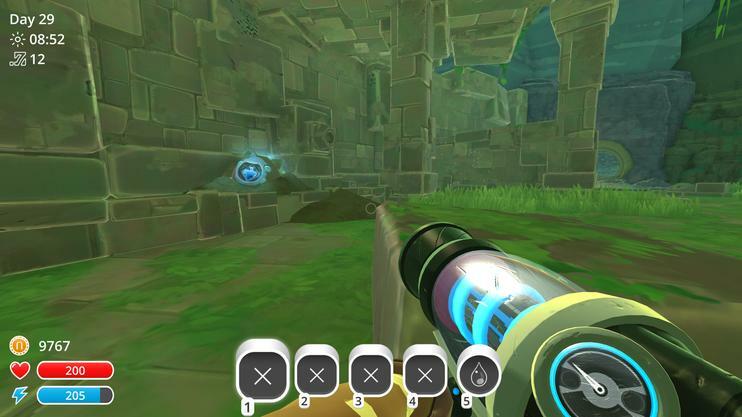 Phosphor's will spawn in the local caves (where there is no sunlight) or you can wait until dark! 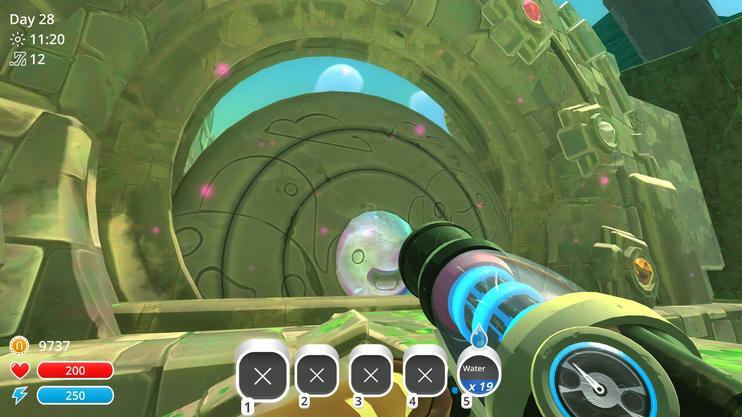 To open the gate you will need to 'insert' each plort into the correct Slime 'slot'. These are stone statues that can be found scattered around the area, each with a matching colour to their Slime/Plort. When shooting the plorts into the slots I suggest getting quite close and aiming straight for the plort slot (diamond/kite shape) to avoid them bouncing around or you missing by accident! Straight forward as you enter the area, it is facing the cave system you exit from. On the right as you enter the area from the cave system. It is facing the gate. As you enter the area, before you reach the Phosphor Statue, there are a pile (in a line) of broken stones. Turn left as soon as possible, and look up to your left. It is on a ledge. 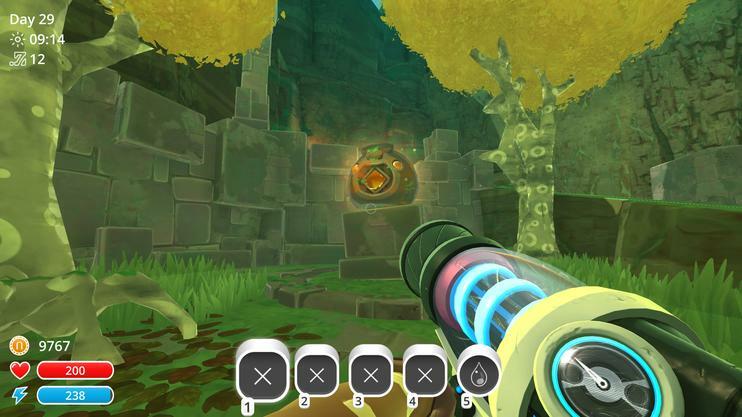 As you enter the area walk straight forward to the Phosphor Slime Statue, turn left when you reach the Phosphor Statue and follow the path. It is straight ahead. As you enter the area you need to head straight forward to the main gate. Once on the platform or ramp to the main gate look to your left, there is a stone platform; the statue is upon the platform. 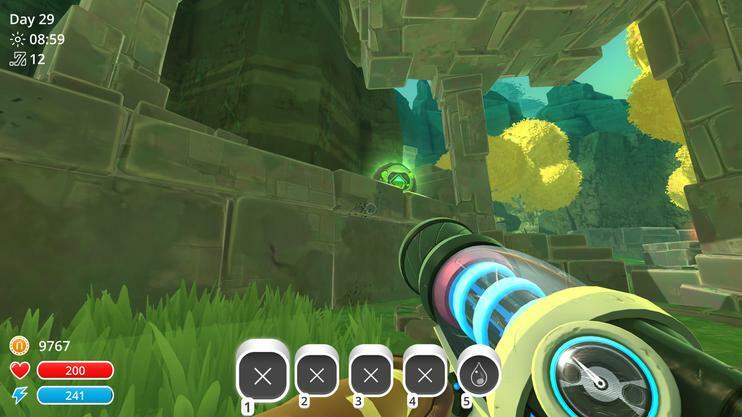 As you enter the area head straight forward towards the Phosphor Slime Statue, jump over the little stone wall and whilst stood right in front of the main gate look to your left and it is on the ground. 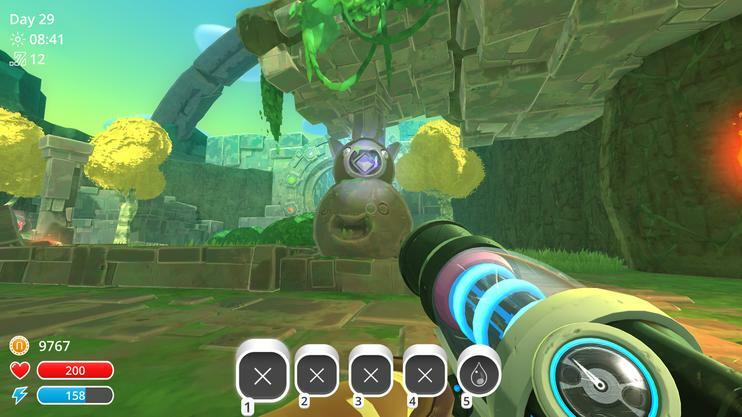 Once you have inserted all of the plorts into the correct statues the gate will begin to sing and open! You will be granted access to The Ancient Ruins, and will receive the following achievement!